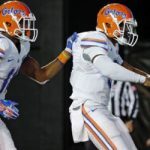 Updated on Friday at 5 p.m.
Florida Gators freshman cornerback J.C. Jackson was grazed by a bullet during a shooting in Immokalee, Florida, on Christmas Eve, reports CBS television affiliate WINK. Jackson has not played for the Gators since the second week of the season as he re-aggravated a shoulder injury and had labrum surgery, sidelining him for the remainder of the campaign. He is expected to receive a medical redshirt. On Dec. 13, he was one of three Florida football players stopped on campus in Gainesville, Florida, by the University Police Department. The UPD eventually charged the driver of the car, freshman quarterback Treon Harris, with a second-degree misdemeanor for driving without a license. Police found small bags of marijuana in the vehicle but did not charge any of the players because it was not in their possession and none of the three owned the vehicle that was driven that evening. Update (Friday, 5 p.m.): According to the Naples News, the part of Jackson’s body that was grazed by a bullet was his eyelid. Additionally, the incident did not occur with men walking up to the car that contained Jackson and the Marcellus brothers, as originally reported by WINK. Rather, according to Jackinson Marcellus, a red car was following Jackson and the brothers when they slowed down to let it pass. At that point, the vehicle pulled up next to the three men and fired at them, causing the driver to lose control and strike a fire hydrant. All three men have been discharged from the hospital with Jackinson Marcellus the last to leave on Friday. 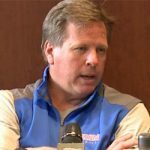 Coach Mac do yourself and your players a favor and forbid anyone from visiting or, if they live in Immokalee, leaving their homes when there from school. My family is from Arcadia. In the 60s we would buy provisions and use Immokalee as a jumping off point when we hunted deer in the glades. Totally wild anywhere South of there and today is a backwater of crime and general lawlessness. It was and is now one of the meanest and wildest places in the U.S. It’s just uncivilized down there. Trust me on this one. Not sure I’d say Immokalee is a lawless and uncivilized backwater of crime. It’s a low income farm town, like many others….which I would take over your large inner city’s. So that was just a friendly little dispute between farmers? WOW 1874. Everyone deserves a chance. I think a coach can make a proper decision whether a child is right for the team no matter where he is raised. I agree that town is a bad place. It’s a real struggle to overcome that environment. I hope Jackson and the kid at Clemson are able to overcome it and be successful. I hope both schools do their utmost to help them succeed on and off the field. I think the above writer did not mean that UF should not take someone from there, just that it’s prudent to be very cautious. Players from there have a lot to overcome, they need all the support they can get. That’s what makes you so dangerous, Michael J. You occasionally write things that make a lot of sense. And you’re right, 1974Gator didn’t say that we shouldn’t recruit Immokalee. Get a grip, people. For some reason some of you feel compelled to run to the defense of places like Immokalee. . like it’s your civic duty, even though you don’t know what you’re talking about. It’s a dangerous place riddled with HIV and AIDS levels that represent 42% of the cases in Collier county, although it has only 8% of the population, all of which is but a symptom of the lifestyle there. Deal with it. Rather than defend the indefensible, maybe helping the kids from there would be a better idea. 1974gator. They are from Immokalee. I live there as well and know the two brothers. That’s the dumbest thing I’ve ever heard. Immokalee may have its problems but it’s no where near as bad as you make it sound. They might as well tell the people of Chicago to stay inside and never come out according to you. Immokalee is more or as dangerous than any inner city. My family connections still will agree. It is what it is. Sometimes the truth hurts. wow, grazing an eyelid. He is incredibly lucky he didn’t lose his eye or worse. Yeah. Either it was a really good shot by somebody who was trying to shoot him in the eyelid at night, or a not-so-good shot by somebody who was trying to kill him. Very scary. So in less than a month he’s riding around in a car that has marijuana in it and then riding around in a car that gets shot up. Hmmm. . . I hope that’s just really bad coincidence, and not a pattern of bad choices. You didn’t need to help reinforce my case about Immokalee but thanks anyway.